Every day is a revision, a flux of emotions and evolution of ideas. 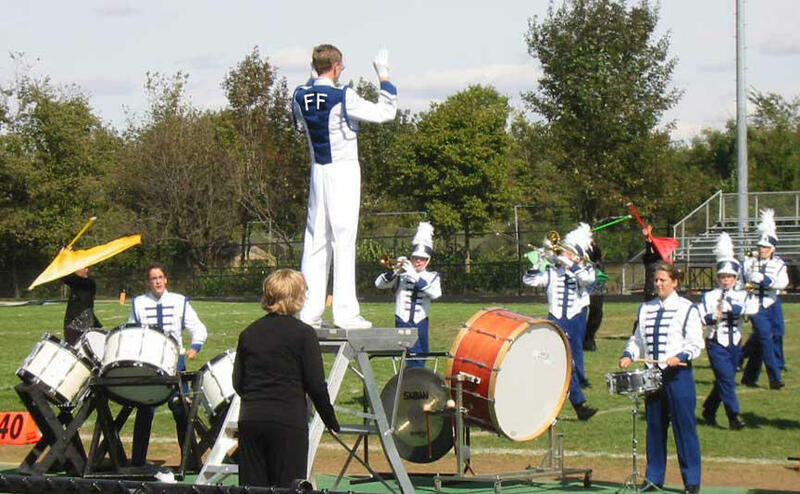 Inspired by Wednesday's blog, I have decided to start a Friends of the Friendless Marching Band. Join the band by leaving a comment and stating the instrument of your choice. Multiple instruments are needed so don't be discouraged from joining just because your favorite instrument has already been chosen. Friends of the Friendless band members are asked to find a friendless blog and submit them to me via a comment.I will visit these blogs and feature one of them on the following Friendless Friday. The other friendless sites submitted will also be listed that Friday. A friendless site should have less than 5 comments a post(but mainly goose eggs) and/or if there is a site meter, less than 10 visitors a day. They should be over six months old and updated regularly. Friend of the Friendless are asked to visit the posted friendless sites each week and leave an encouraging word. Tell them that you are a member of the Friends of the Friendless Marching Band. This sounds like a great idea...I hope you have good luck in it. Thanks Zeb for signing up. Are you going to submit a site? It can be yours or someone else's that you think is worthy of the honor. OK, I play the baritone, which is actually the instrument I played in school. Hi Carol got your nice comment on my blog. I'm not quite sure how to do this but anyway I always wanted to play the piano, is that included in a band or not? :o)I see you have already made a comment on one of my blog friends site..so thanks for that! I am not very computer savy or literate so hard trying to figure out how to do this! It took me forever to figure out how to do the adding links to my blog via the template. I would like to be a member of your friendfriday deal..its great idea..will do my best..I have a very old slow dial up pc..
Yeah for our new piano player! As time permits...I will do follow the band! Playing my tamborine! Glad to see everyone here! Would be honoured to join your marching band, but can't read a single musical note though. Always wanted to learn playing the guitar, but I would be in Mariachi band instead, wouldn't it? Here's one of my favourite blogs, I just like the way his photos are taken, just like Sister Celtics' - flawless postcards like. Thanks again for your comments and the band members too. I'll do my part the best I can. I want to play the French Horn. I like this blog...can't really read it (I'm language impaired, unfortunately) but love the images and it seems like a gentle site. That's my suggestion for FF. I would like to play the harp, please. Trumpet! It has to be trumpet! Living with two violinists I need something to drown them out at times.... I'm in. Hi Eph2810! Nice to meet you. Finally, we have a trumpeter! Glass Armonica, I think would be a great add to FFMB! Can I play too? What is a glass armonica? Yes, of course, we want you to be a part! Glass Armonic is a series of bowls with liquid in them. they're played with a wet finger. Ben Franklin invented it. I read about it some time ago, but actually saw one on CBS Sunday Morning Show about a month ago. Cool instrument. What am I suppose to do tomorrow? For more information on how to join the band and what is expected of a band member, see the bottom of the most current Friendly Friday post. I can play the triangle. Does that count? carol! thanks for stopping by! what a neat idea. can i join your band? need a theremin player? Yes, you are a part of the FFMB now! I would like to join the band. I want to play the the mouth organ. Great Kim. Glad to have you in the band. To join the Friends of the Friendless Marching Band, leave a comment stating that you wish to join then choose any instrument you like. (ability isn't an issue for this cyber band) We have three piano players, a harpist, a theramin and french horn player plus a variety of more so you get the idea that any instrument is possible. On Fridays, the band meets to visit the chosen friendless sites which I list. Then the band leaves friendly comments for our honored recipients. Let them know that you are from the FFMB. Get to know other band members. There is sure to be someone you can connect with. Nominate friendless sites. They can be bloggers you know or ones that you come across in your blog surfs. Think unique. These sites have less than 5 comments/post and be posting currently. Leave me a comment with their address or email me at Carol_ffmb at yahoo.ca. I will let you know whether they have met the friendless criteria. Hi - Thanks for nominating my blog! Very unexpected. Can I play the piano accordian? Oh, Tara, yes we could use a tenor sax! well, you don't look very friendless to me; but i'd like to play the drums even tho i'm a pianist. I'm going to play the bass....the upright bass with a uni-wheel and a fake-goatee. I'm best at playing the radio, but since I don't think it counts, can I be the flautist? It's been a while since I've played the flute, but I woudn't mind giving it a whirl. Oops. Somehow my second link didn't come through. It's supposed to be http://littlejourneymama.blogspot.com. Thanks! I've been on a Sabbatical for awhile and uncertain when the band will be playing next. I'll bookmark your nomination for future consideration. Thanks. I'll add your name to the FFMB.